Pocket Refractometer | ATAGO CO.,LTD. 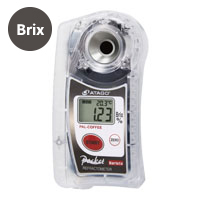 Designed with a full Range (Brix 0.0 to 93.0%), the PAL-3 works perfectly for measuring almost any samples.This model has been modified to have a high measurement accuracy at +/-0.1% Brix, the highest accuracy model in PAL series. 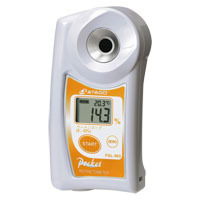 The PAL-1 works perfectly in measuring almost any fruit juice, food, or drink, such as soup, sauce, ketchup, tomato sauce, low-sugar jam, or marmalade. PAL series comes with Data Transmission Function with NFC（Near Field Communication)technology.Data history can be accessed by bringing PAL-NFC to any Android devices or PC-linked USB NFC Reader. Samples with high temperature such as ramen soup, tare sauce for beef bowl, syrup, jam, soy milk etc. had to wait 15 to 20 seconds for measurement.The PAL-H is a high temperature sample, and it has Mode H that can perform stable measurements at a high speed of 2 seconds. " Improved Repeatability with Mode S™ Technology. Mode S™ is the solution to fluctuating measurement values.Ideal for fatty and/or dark samples, such as dairy products. The long-awaited "Pocket" digital and compact sized PAL-RI was released.When the start key is pressed after placing some droplets of sample on the prism, the Refractive Index (resolution 0.0001) and temperature °C of the measurement will be displayed continuously. The "Pocket" Honey Refractometer, PAL-22S can measure the % water content of honey easily and displays readings digitally. Comfortable, easy to use, light & compact. Measurements can be taken anywhere. PAL-03S is suitable for measurement of salt water(g/100g).This model is also used as the important management tool of the spraying the snow-melting agent on the road. 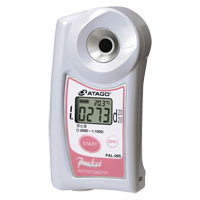 For the model with g/100ml, please choose PAL-106S. We also have Specific Gravity model and Baume model. This is the essential item in creasing your Ramen.This model can measure not noly the concentration of Soup and Tare but also baume of kansui used during making the noodle. If you are interested in Meister set of refractometer and salt meter, pleas choose Ramen Meister Set. For user testimonials of Japanese famous ramen restaurants, click here. You can measure solid contents of soybeans in the soymilk by PAL-27S.It is extremely water resistant for easy clean up. Just run it under the faucet! The PAL-Urea is specifically designed to measure the Urea concentration of Diesel Exhaust Fluid (DEF), also known as AdBlue* in Europe. Already proven in Europe as the only reliable, go-to instrument for easy and accurate checks, the PAL-Urea is now available in North America in time for new 2010 EPA regulations on diesel emissions.DEF needs to have a 32.5% Urea concentration in order to work effectively in SCR engines. Make sure that the DEF that comes out of your pump and into your tank is pure in quality and safe from potentially harmful additives by using the only digital hand-held refractometer already trusted by European consumers. * AdBlue is a trademark of VDA. This is ideal to measure Hydrogen peroxide concentration commonly used as a disinfectant. PAL-91S, easily measure the coolant in brine and other agents of Ethylene Glycol.Antifreezing solution (coolant) whose main ingredient is ethylene glycol is widely used as mixed in cooling water of car's radiator, as cooling medium for central air - conditioning system, freezer / refrigerator, cooling coil, cooling fixture etc. The higher the concentration is, the lower the temperature at which ethylene glycol is frozen is. Therefore, it is needed to adjust freezing temperature of antifreezing solution so that it dose not freeze under a specific operation temperature.For Prolylene Gycol, please choose PAL-88S. PAL- cleaner is a model that can be measured with high resolution of decimal two digits of 0.01%.This is ideal for measuring low concentration of the solution, such as industrial cleaning fluid. PAL-40S is suitable to measure the concentration of Sodium hydroxide (g/100g)/water solution.